Staten Island, NY - The man who jumped off the Verrazano-Narrows Bridge last night has been identified as a Brooklyn resident. Arkady Adler, 33, of Bay 17th Street, abandoned his car on the Staten Island-bound side of the span’s upper level shortly before 10 p.m. and then took a fatal plunge over the edge by the bridge tower closest to the Brooklyn side. Canvassing NYPD ESU Trk-5, NYPD Aviation and Harbor units eventually found Adler’s body on the rocks near the Brooklyn side. Adler was the second man to fatally jump from the Verrazano this year. In November of 2007, two people took a deadly leap off the bridge within two weeks of each another. 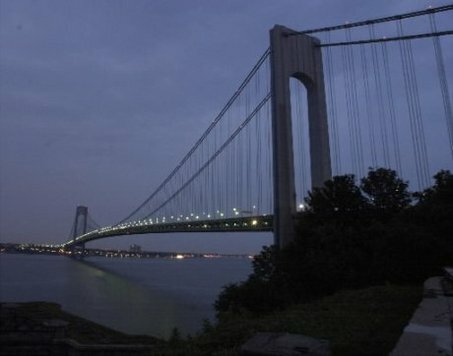 Last March, two borough lawmakers—Assemblyman Michael Cusick (D-Mid-Island) and state Sen. Andrew Lanza (R-Staten Island)—introduced legislation calling for the installation of suicide-prevention phones on MTA-operated bridges, including the Verrazano Bridge. The phones, which would be linked to a 24-hour suicide prevention hotline, would be similar to those installed last year on the Tappan Zee and Bear Mountain bridges. Baruch Dayan HaEmes. What a horrible way to die. BDE. The $10 comment is in poor taste. Suicide is a tragedy for all those connected to the deceased as well. What other type of comment can you expect from a MORON. Just shows the level of intelligence of this poor undeucated boor. I'm sorry, you don't know what a boor is, try prost or BULLVAND, or grubb yung. They all fit. Some Ahavas Yisroael for this poor soul & his family would have been more appropriate. R"L! what a horrific tragedy for the family and klal yisrael, when a person feels so helpless, and feel that they have no other way out! anon: 9:28 - you should really thing before you post - we are 1 week before R"H! I'm sick! You are the sick one for condoning the poor taste comments being about a troubled soul, who felt it necessary to take his own life to escape his tormments. Perhaps if some one had reached out to this troubled person and helped him he might not have taken this last resort. And all you can do is condone stupid comments. You are the one who needs to daven alot next week and put in context what is said. rabboisai, 9:28 serves a useful reminder to us: while we have to be dan es kol ha'adam lekaf z'chus we cant be naive and believe that everybody out there is a decent individual. He/she might look, dress and speak the sameas the rest of us. But when they can be anonymous, their dark satanic soul slithers out of his/her disguise. It's right before R"H. we ALL Lneed to do some cheshbon hanefesh and explore if C"V we have even a speck of aczurius in ourselves and purge it out. 10:53...if i understood you correctly , u said he did what a lot want to do. if u have suicidal thoughts SEEK HELP IMMEDIATELY!! contact a local jewish agency, a rabbi, a social worker. Did he jump to a conclusion? It is a terrible tragedy, but I have to say that reading the typical comments written here always makes me laugh. Yidden can argue about anything! Shame on all of you making fun of him. There are many family members crying as they lost a love one. "But when they can be anonymous, their dark satanic soul slithers out of his/her disguise." Wow, that's a bit harsh, no? Wow, that's a a bit harsh, no? Anon 2:40. Maybe before you follow you take a spelling class? I thought a yid is not supposed to kill himself. So why do you say people to follow??????? Don't let depression rule you - you can rule yourself! 1. Morons - he jumped on the Staen Island bound, you don't pay tolls until you cross the bridge on the staten island side. 2. Mabe all these insults we are throwing at him will give him a Kapora to one of the biggest aveiros there is - meabet atzmie lodaas. 4. May hashem have mercy on his soul. Nebech, all of you who want to do the same, remember suicide is a permanent solution to a temporary problem. Many people lost a lot of money the last few weeks. Many people lost houses that were bought to flip; many people have lost their job or are about to. If you want to stop suicide then START helping your friends, neighbors and family. We had a few cases in the last few years. I think someone was stopped this year in Williamsburg. This is a wake up call. Let's start doing something before for some it will be too late. Do any of you know a person personally who committed suicide? I do. Many times, unfortunately, the medication the patient takes as prescribed by physician is the actual cause. Prozac, for one, has been linked to suicide. Hashem Yishmereinu. If the phones had been up and running he surely would have been saved. Obviously if he had the presence of mind to choose the side of the bridge to save $10.00, as oppossed to paying, he still had a good head on his shoulders. His family should sue for a million and $10 dollars. Easier said then done. Lord Mike (Bloomberg) won't let us purchase guns! #31, I agree. Most suicides are drug related- including prescribed drugs, especially anti-depression & smoke cessation medication. I am absolutely certain of this. I believe this will be accepted as fact in the future, but until then the pharmaceutical companies have pills to push. Think of cigarettes 50 years ago. Same thing. arkady was my cousin and he was a great guy..we had his levaya today..his name is avraham yona ben yehuda and we should all do something in his memory..myself and his entire family are mourning his loss. To:5:57pm if the phones were there he would not have jumped!!! Are you stupid!?! can the phones work by themself? if he was going to jump and he took the side that he wouldnt have to pay means that he thoght this through and no phone is going to stop him!! To:finveenemtmenseichel:anonomus is not just for cowards who are afraid to show there own names (I see you didn't wright your proper name (coward) but also to protect the good! So watch your tounge "...dark satanic soul slithers out of his/her diguise" think about it "people in glass houses don't throw stones"
It is such a shame that people think that suicide will solve any problems. It only makes more trouble and heartbreak for those left behind. A solution would be to make very high fences along the water so no one will climb and jump. For the occasional accrobat that wants to scale a high fence, I suggest that there should be barbed wire that will ripe the kishkes out of anyone that climbs and wants to jump. The act of suicide to punish others (unconsciously) seems like a most selfish deed. Better to have had it out with people and release the anger than turn it on himself! The problem with suicide as a solution is that it totally unaccepted in the next world and the person so doing has to come back to deal with the problem(s) the suicide was supposed to avoid solving. If we come into the world for purpose of making correction - the suicide way does not achieve this purpose. Connection is real - isolation is all to often self-generated. Reach for help! And obtain a higher level of insight, understanding of Gods purpose for you here on earth. Terrible times make some people do terrible things to themselves. Suicide is an aveira like murder and must never be done,exept in cases like Shoul haMelech.The Jewish community leaders must reach out and help those in trouble before concerning themselves about color of clothes and size of hat brims. Rabbis.please put your priorities in proper order! TRS: not harsh at all. there is a whole extended family of broken people right now. that somebody's first gut instinct is to laugh betrays a diabolic viciousness that b"h you cannot relate to. may we never go through what poor Mr. adler had no doubt gone trhtough which led to his terrible decision, may we never suffer the debilitating shock and heartbreak his family is enduring at this time. as for all of you who continue to trivialize this tragedy and poke fun, your day is coming. when you satnd b4 the RSh"O after 120 you'll be asked to read your comments b4 Beis din shel maala. i'm sure they'll appreciate the humor and sharpness of your lines. they'll laugh, im sure. they might even high-five you. avi: i don't understand your comment and frankly i'm not terribly upset about that. but i could tell you have a problem with me wanting people to act like human beings. we are supposed to be rachmonim bnei rachmonim. wanting to turn the tables and making me into the bad guy here indicates the same cancerous disease that causes people to hate and threaten those who try to do s/t about the monsters who destroy our children. Arkady was my cousin too and I can't believe how insensitive some people are. He wasn't just a guy, he was someone's best friend, someone's brother, someone's son- he touched many people's lives. He was a great person and he will truly be missed by everyone who knew him. I met Arkady only two times in my life and I'm very shaken up by the whole thing. I met him with his parents recently and I can tell you that they are incredibly wonderful people who loved him very much. I spoke to him in the afternoon before he jumped for over a half hour and he didn't show me any warning signs. --- In fact, we were talking about hanging out tomorrow (a week after he jumped). He recently applied for a promotion, bought a new car and not so long ago, bought a condo. I'm guessing even the people close to him did not know the pain in his heart. I hope that he has peace now. I wish that his family finds peace and joy in thier lives. May HaShem bless them and keep them. I just posted above. I'll include him in my prayers.